Delivering on the promise through continuity. How do you drive measurable customer engagement equally among three distinct audiences? 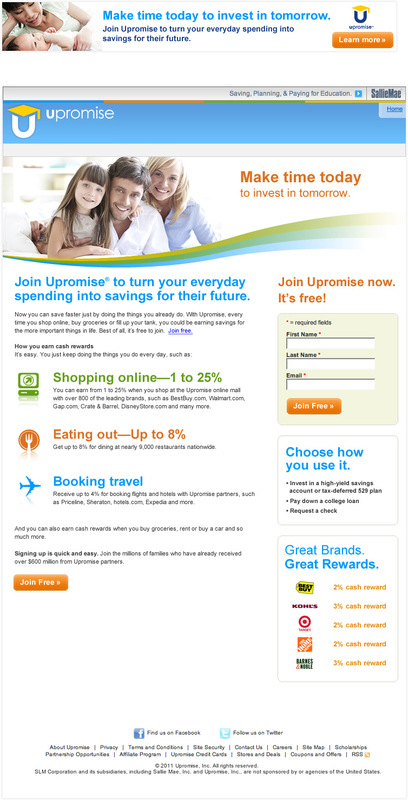 Upromise was looking to increase traffic and sign-ups to its site. After identifying three important audiences (Deal seekers, Students and Young Families), and developing a communications strategy to reach them, we created target specific banners and landing pages that not only increased click through rates, but actually converted these visitors into new customers. We did this by developing messaging that resonated with prospects and through a continuity of messaging (from banner to landing page) we were able to have very high conversion rates. This campaign led to an astounding 300% lift in customer acquisitions over the previous control creative. Connect with us today to find out how we can convert customers for you.